Repository of all Current Based Notes you need for UPSC preparation. Topic wise arranged notes for easy access. Loaded with Facts and Examples for each topic. Accessible via OneNote or Evernote which works in offline mode too. Available on mobile also. Read same notes on move. Contact 9897588852 via Whatsapp/ Telegram or email to [email protected] if you have any query. What all sources are covered in “IAS4Sure Notes”? Newspapers like The Hindu, Indian Express, Live Mint etc. NOTE: Static portion is not covered in these notes. How to optimally utilize IAS4Sure notes? IAS4Sure notes should become your personal Wikipedia. 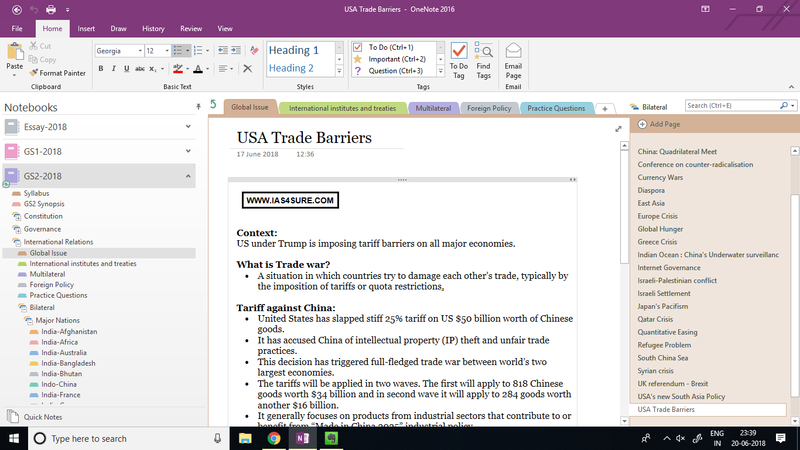 If you want to read about something, use search functionality of OneNote/EverNote and read 2-3 notes that pops-up related to that topic. Use recent Notes functionality to keep a tab on latest changes in notes. Try to use various facts, examples, case studies etc. given in notes. We try to provide a small footnote where to use them. Do I need to read newspaper if I am a subscriber of IAS4Sure Notes? It improves your reading speed and analytical capability. It improves your comprehension ability. It inculcates mature writing style. Is there any difference between Evernote and OneNote access? No. Same notes are provided in both. Both are free softwares. Interface is different in both of them. So, you can choose according to your linking. We will share demo notes in both of them and you can choose according to your preference. Final notes will be shared either in Onenote or Evernote. Note: OneNote sometimes does not work in Pirated windows. So, please ensure that it is working before making payment. Are these notes updated daily? No, we do not update daily. We update our notes every 2-3 days. In worst case, they are updated weekly. I am not aware of Evernote/OneNote, what should I do? After, they are installed, create an account in them. You can use your gmail id to open account. How can I subscribe to “IAS4Sure Notes”? Please provide us your ONENOTE / EVERNOTE id after payment. If any doubt, ping us at number given below. If you have any queries than you can contact us at 09897588852 (whatsapp/telegram only).